Before receiving his DDS at the University of Southern California (USC), Dr. Rafie received his undergraduate degree from the University of California, Los Angeles (UCLA) in 1988 and has practiced in Granada Hills since 2002. Dr. Rafie is also an active member of several prestigious dental organizations including the American Dental Association, the California Dental Association, the Infectious Disease Association of California, and the San Fernando Valley Dental Association. Dr. Rafie met his wife while in dental school, and they now have two teenage children. When not attending to the dental needs of the Granada Hills community, Dr. Rafie enjoys playing tennis, basketball, and soccer, as well as hiking and traveling. 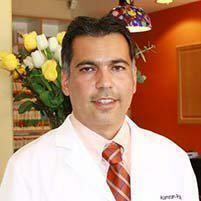 Dr. Rafie speaks several languages, including English, Spanish, and Farsi. In addition to general dentistry, Dr. Rafie offers cosmetic dentistry, pediatric dentistry, and periodontal services. Dr. Rafie prides himself on providing outstanding dental care that meets or exceeds standards of care at reasonable prices. He’s also sensitive to his patients' needs and concerns, and he respects your time by working as efficiently as possible during your appointments (and that includes using all the latest technology).